Pedestal sinks are an attractive and simple sink design, which can also be easily incorporated into a vanity. The transition from a basic pedestal sink to a vanity-enclosed one will provide additional storage, help protect the pedestal sink from damage, bring an element of wood into the bathroom and give more decorative freedom regarding the tones and colors of the wood. This frees the decorator from the constraints of white ceramic. 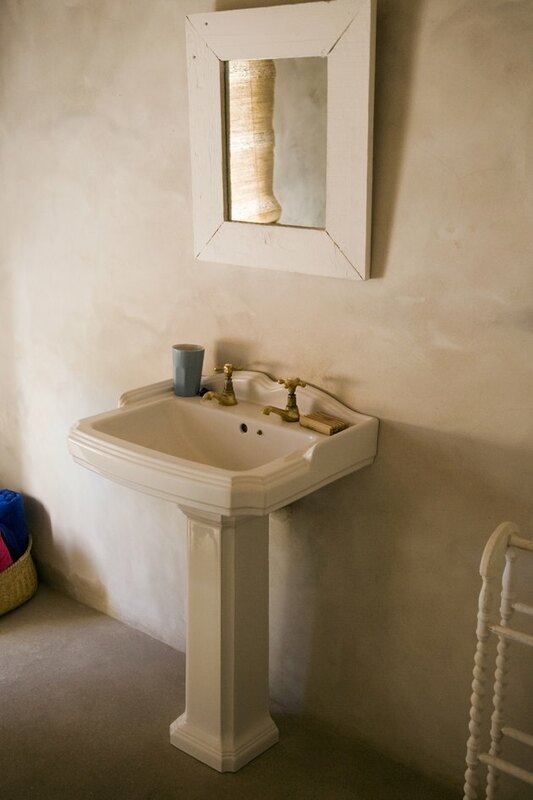 A pedestal sink can easily be encapsulated with a vanity. Space out two 1/2-by-24-by-36-inch plywood boards on your working surface. Have an assistant hold them up parallel to each other, resting on their long, thin sides. Think of these boards as the side boards. Set a 1-by-24-by-24-inch plywood board against one end of these side boards to be the top board. Make the edges of the boards even and drill holes every 6 inches through the top of the top board and into each side board. Attach the boards together with 2-inch wood screws. Repeat on the other end of the side boards to create a bottom board with the same proportions as the top board. Hold the vanity up to the pedestal sink and mark the amount of wood that will need to be cut from the top and bottom boards in order to fit the vanity snugly around the pedestal sink. Mark a conservative estimate that cuts slightly less wood out than needed. Cut out the necessary sections of the top and bottom boards and slide the vanity onto the pedestal sink. Remove the vanity if it does not slide on, and sand or cut the sections that are too tight, being careful not to remove too much of the top or bottom boards, as the final fit should be very snug. Fit the vanity snugly around the sink. Set a 1/2-by-24-by-37-inch board up against the frame of the vanity, evenly centered and leaving 1/2 inch of space on the top and bottom boards. Position two side-mount cabinet hinges against the side board and this new board, which is the door. Use a pencil to mark the spots where the hinge screws will go. Drill out these holes. Attach the hinges to the door and the side board, using 1/2-inch wood screws.